So what is an explosion? Defined as any uncontrolled combustion wave. 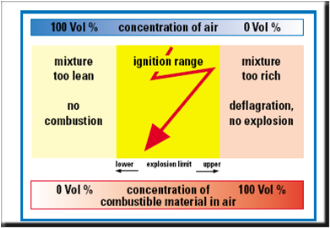 For any mixture of a combustible gas or vapour with an oxidizer (air) there is a critical ignition energy. 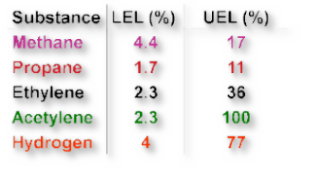 At a critical concentration called the most easily ignited concentration (MEIC), the amount of energy required to cause ignition is minimal. The critical energy at the MEIC is called minimum ignition energy (MIE). For the assessment of the ignition of gases a device defined in EN 60079-11 is used. This gives the Minimum Ignition Current (MIC) ratio. It is the means used for classifying gases and vapours into IIA, IIB or IIC.